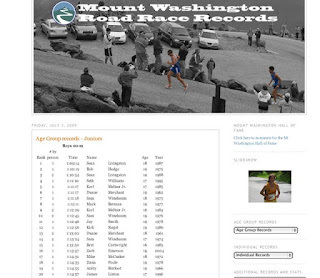 The master of all things Mt Washington Road Race Dave Dunham has a great blog with all kinds of historical statistics including junior records. I found this listing of the top all time junior times and lo and behold I am listed. Note Karl Meltzer of ultra fame is in 5th place. Most from the golden years of New England running the 1970's and 1980's when speed was king, even uphill speed climbing the 4772 vertical feet in 7.6 miles. Those fast days are long, long gone for me but I have never tired of putting one foot in front of the other in all seasons and all terrains. Now if I can just get in the 2011 edition via the lottery! Two years in a row a no go for me to this most classic of mountain running running races. Runner's World Out of Touch?